When she was a girl, Lisa See spent summers in the cool, dark recesses of her family's antiques store in Los Angeles Chinatown. There, her grandmother and great-aunt told her intriguing, colorful stories about their family's past--stories of missionaries, concubines, long wars, glamorous nightclubs, and the determined struggle to triumph over racist laws and discrimination. They spoke of how Lisa's great-great-grandfather emigrated from his Chinese village to the United States to work on the building of the transcontinental railroad as an herbalist; how his son followed him, married a Caucasian woman, and despite great odds, went on to become one of the most prominent Chinese on "Gold Mountain" (the Chinese name for the United States). As an adult, See spent five years collecting the details of her family's remarkable history. She interviewed nearly one hundred relatives--both Chinese and Caucasian, rich and poor--and pored over documents at the National Archives and several historical societies, searching in countless attics, basements, and closets for the intimate nuances of her ancestors' lives. The result is a vivid, sweeping family portrait in the tradition of Alex Haley's Roots that is at once particular and universal, telling the story not only of one family, but of the Chinese people in America itself, a country that both welcomes and reviles immigrants like no other culture in the world. Lisa See, daughter of novelist Carolyn See, is a Chinese American writer and novelist. Although born in France, she grew up in Los Angeles and graduated from Loyola Marymount University. 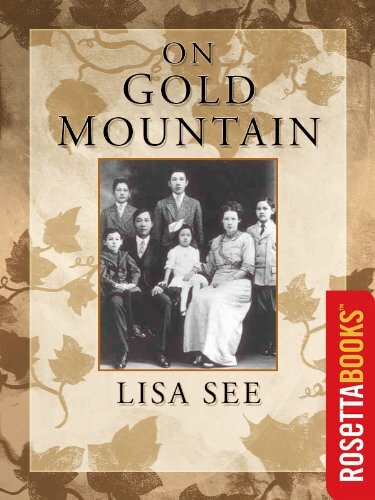 In her first book, On Gold Mountain, she uncovered in her family tree a capsule history of the Sino-American diaspora: her great-grandfather, Fong See, founded a California business, married a Caucasian woman and fathered many offspring, and returned periodically to China to redistribute some of his wealth and launch another family. See was West Coast correspondent for Publishers Weekly, has written articles for Vogue, Self, and More; has written the libretto for the opera based on On Gold Mountain and has helped develop the Family Discovery Gallery for the Autry Museum, which depicts 1930s Los Angeles from the perspective of her father as a seven-year-old boy. Her exhibition On Gold Mountain: A Chinese American Experience was featured in the Autry Museum of Western Heritage and the Smithsonian. See is also a public speaker. Author of the critically-acclaimed international bestseller Snow Flower and The Secret Fan (2005), she has always been intrigued by stories that have been lost, forgotten, or deliberately covered up, whether in the past or happening right now in the world today.